The PM of India, Narendra Modi was on a diplomatic trip again and the media of India was on to its hack routine again. There was threadbare discussion on everything of little consequence in our media. When the PM was addressing the UN, building world opinion on poverty, terrorism etc, our media was criticising him for not meeting PM of Pakistan. When the PM was visiting technical and corporate giants, our media was counting the number of dresses he changed. In the same vein, when our PM expressed his vision of making India a $20 Trillion economy, our media got busy trying to falsify him. The seeming intent of the opposition (Congress) and in toe, our media, was to write off PM Modi’s entire trip as a failure because he allegedly wrongly cited the size of Indian economy as “8 Trillion” in his townhall meet with Mark Zuckerberg. The charge from the media was led by The Hindu, commandeered by one Puja Mehra. Mehra was earlier involved in another incident where she misquoted Arun Jaitley, for which The Hindu had to later apologise. Much of the article in The Hindu was based on Congress’ allegations. The Congress alleged that India’s GDP was close to 2.50 trillion and that it was $2.27 trillion when the UPA was evicted from power by the electorate. The Congress may not be wrong in this contention, save a little detail which exposes their gross ignorance or deliberate sophistry. India may indeed be a $2.5 trillion economy at “Nominal GDP” levels. And where did Modi get this $ 8 trillion figure from? Not from any homegrown “Sanghi” economist but from the International Monetary Funds “World Economic Outlook” report. The report clearly state the figure $ 7,996.623 Billion which converts to $ 8 Trillion. So Modi was right to mention the size of India’s GDP in PPP terms and Congress is either ignorant or malicious in raking this up as an issue. The bigger tragedy is that The Hindu did not bring this out in its article. Rather, it seemed to justify the erroneous allegations made by the Congress. If there were any doubts on The Hindu’s stand, they were cleared on Puja Mehra’s Twitter timeline. When twitter users , brought out the PPP aspect and challenged Puja on her report, she came up with many retorts. The sense of them all was that “Modi is wrong about India’s 8 trillion GDP, and the outrage by Congress is justified”. It was rather bewildering because neither Puja, nor anyone from The Hindu objected to this claim when earlier this year in June itself, the President of India cited this number. Of course no journalist turned “fact-checker” when the President tweeted this, because in India, only what Modi says should be subjected to all sorts of tests. might well reach 8 trillion by year end, Puja repeatedly threw a World bank link that said India’s “nominal GDP” (also called Current dollar GDP) was $2.067 trillion. This was supposed to falsify the contention that India’s GDP PPP was $7.4 trillion in 2014. She also invented the argument of “data vs projection” whereby her figure of $2.067 trillion was “Data” and the $7.4 trillion figure was “projection”, hence false. Hence Modi is wrong. 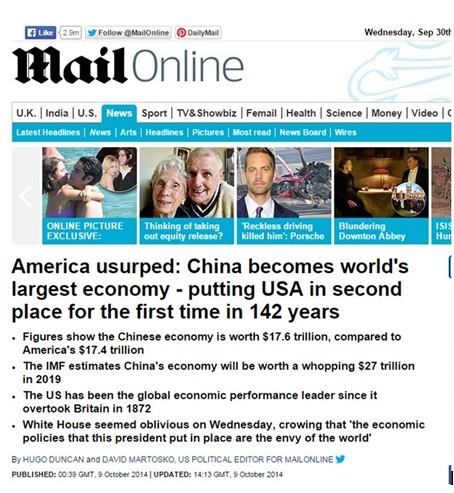 Hence anyone citing the $7.4 trillion figure is running a malicious campaign! I drew a report from the World Bank site on whose data Puja was vouching. But it appears World Bank was also running a motivated campaign too! GDP at Current US$ (or Nominal) is $2.067 trillion which Puja called “data”, hence correct. Either both are correct, or both are wrong or maybe this is a World Bank conspiracy against Puja! This issue gives us more insights. It is also an example of how journalists brazen out their own inadequacies, don’t show grace to accept mistakes but rather invents concepts, facts and frame convenient rules to reject all accountability for their mistakes. In one of her diversions, she also invents a distinction between “projection” & “data” when Prof Vaidya reasons that there are no such distinctions. For another diversion, Puja invents a role and meaning of ICP (International Comparison Program) for her convenience. ICP is an international program to “improve and standardize methods of calculation of PPP”. In no way does it mean that PPP not calculated through the ICP is wrong. Also, even if we take her view at face value that 2011 “data” is the “latest data”, in 2015, if someone has to state Indias’s GDP on PPP basis, does he use 2011 values and say that 4 year old values are applicable even for 2015? This is rank stupidity. 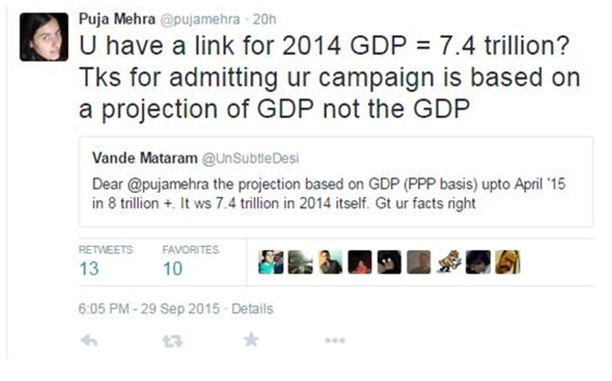 Even if the 2015 estimates are not “data” as per Puja Mehra, they are far more closer to the reality as of today than data from 2011! The onus now lies with The Hindu to repair the damage done. The right thing to do would be to bring down the article and offer an apology to the PM for concocting facts to his detriment. The Hindu would also do well to apologize to readers for misrepresenting facts and misguiding where it was expected to inform and educate. Any news media worth its salt would do it in keeping with journalistic ethics.